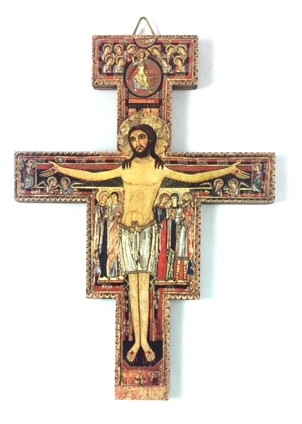 This well crafted 6” crucifix features color detail of the San Damiano crucifix. “Go repair my Church, which as you see is falling completely in ruin” -when the image of Christ in the crucifix at San Damiano miraculously spoke these words to St. Francis, he was awakened to new zeal. He first concentrated on repairing the church buildings of San Damiano and nearby churches. But his great “repair” to the Christ was the founding of the Franciscan Order, which began with the followers that Christ began to send to him shortly after the vision. An unknown Umbrian artist painted the original crucifix in the twelfth century. As we can see, it is strikingly iconographic in character; because of this, many identify the artist as a Syrian monks in the area at that time. 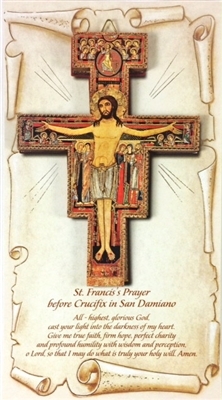 In 1257 the Poor Clares left San Damiano for San Gorgio, taking the crucifix with them. It was placed on public view for the first time in modern times in Holy Week of 1957, over the new altar in San Giorgio's Chapel in the Basilica of St. Clare of Assisi.